In all my years as a broker, I have never seen such a plethora of offerings that buyers enjoy due to real estate depreciation. Home values have fallen to levels we never thought we'd see again, and historic low mortgage interest rates add the cherry to the top of this home buyer's treat. But the real estate depreciation has not been spread equally across all areas or price ranges, so it is important to know how each market segment has been affected by a loss in value. I believe there are two primary reasons that the low end has fared worse than the other two price ranges. First of all, we grossly over-built the student rental market during the boom of the housing market when several publications named Tallahassee a top real estate investment market. With an excess of this supply, it is not surprising the values have fallen. Secondly, the low-end market is primarily an investor market. Real estate investors who watched their equity completely disappear were far less motivated to keep a negative-equity investment than were owner-occupants at higher price points who actually live in the devalued properties. This ability to "hold on" at the higher levels have slowed by real estate depreciation, as well as the current rate of home sales. When we break home sales into the three property types, it is no real surprise to find that single family detached homes have been the most stable, while condominiums have fared the worst. The downtown condo market in Tallahassee was created during the boom of the housing market, and was totally crushed when the market collapsed. This was an unfortunate time to speculate in downtown Tallahassee, and it will take many years to liquidate and balance the condo market downtown. The loans that made the top-end condo values possible no longer exist, so I would expect it to be the sector of the market that lags the longest. 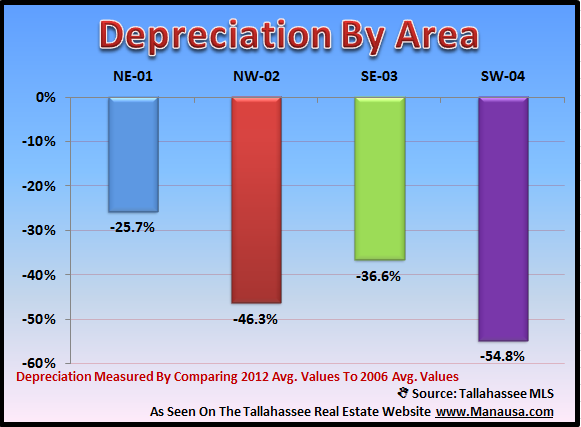 When we look at real estate depreciation by area, we find that Northeast Tallahassee has weathered the market the best, while Southwest Tallahassee has done the worst. This is really not a big surprise, as the South and West sides of Tallahassee had the most speculative new construction occurring during the height of the real estate boom, and they were thus left holding the most inventory when the market began its decline. 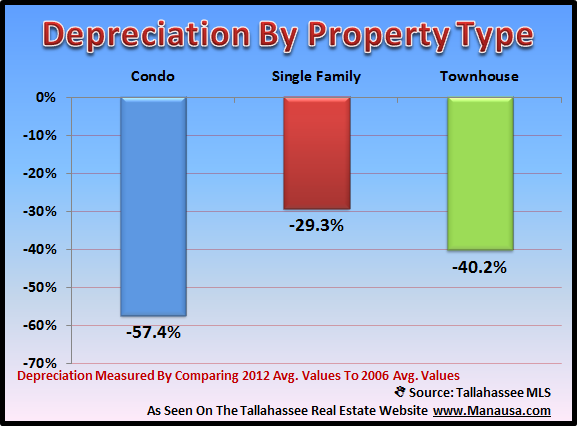 The real estate depreciation is highest in Tallahassee neighborhoods that have seen the most new construction since 2005. The graphs above show that opportunities are not consistently spread across the board, and they also show that understanding where to go and what to buy might be the biggest security blanket a home buyer can find. 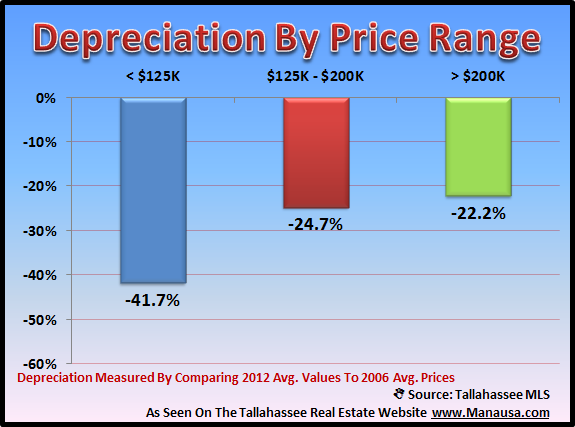 Buyers should use this understanding of the real estate depreciation in Tallahassee to help them choose the right home. Selecting the right real estate agent is another wise thing to help mitigate risks when buying a home. A real estate agent who understands the housing market and is a true student of home values will provide better counsel and guidance when it comes time to choose the next home for you and your family. Choose wisely. So, if you are thinking about buying a home now and want to take advantage of great home prices due to real estate depreciation, just drop me a note and we can schedule a time to help you evaluation the best opportunities in the market today.